What is most important to our system? What could negatively impact its success? How do we deal with these possible risks? The closer we can bring postmortem language into planning language, the closer we get having healthier discussions around what testing can offer and where other teams play a role in that ability. There are two entirely different discussions here going on. One views testing as overhead and process to be overcome… because risk somehow discrete is something to be mitigated. This is false, but accepting uncertainty is a hard leap for project planning. The second is retrospective and viewing any failure as a missed step. Suddenly the pressure is an expectation that any bug should have been tested/caught, and the previous expectations and concerns around timelines feel insignificant, now that the team is facing the reality of the bug in production and the impact on customers and brand. Where are the areas of uncertainty and risk? What are the ranges of types of issues and bugs that might come from these areas? How bad could such an issue be? Which customers might be impacted? How hard could it be to recover? How likely are we to detect it? Engineers get highly involved in this discussion… If such an issue did exist, what might we need to do to explore and discover the sorts of bugs we are discussing? How much effort might be needed to safely isolate and fix such issues without impacting the release? What about after the release? What was interesting, is that suddenly, we were using the same language around testing before the release, that we only ever used after we released knowing that a bug actually happened in production. We used language around uncertainty. We starting using language around the reality that bugs will emerge. We started speaking around methods to perform the implementation that might help us make better use of testing in order to prioritize our time around the sort of issues that we could not easily detect or recover from. We started speaking a language that really felt inclusive around shared responsibility, quality and outcomes. I only have one data point involving RiskStorming… but took a similar approach with another team simply with interviewing engineers, and reporting on uncertainty, building a better sense or reality on trade-offs regarding these uncertainties, and options to reduce uncertainty. It had similar positive outcomes as RiskStorming, however required MUCH more explaining and convincing. Let’s begin with a special thanks to Benny & Marcel. Where would we ever be without the good help of smart people? It’s been 2 years since we launched TestSphere: A card deck that helps testers and non-testers think & talk about Testing. A Security deck! A Performance deck! A Usability deck! An Automation deck! Well… yes. The possibilities are huge, but it needs to make sense too: Value-wise & business-wise. RiskStorming is developing to become an incredibly valuable format. It combines the two aspects of TestSphere perfectly. In its essence it makes your whole team have a structured conversation about quality that is loaded with new ideas and strategies. To be blunt: It helps testers figure out what they are being paid for and it helps non-testers find out why they have testers in the first place. It’s the learnings and insights of having run continuous RiskStorming workshops for many different businesses in many different contexts that drive the new TestSphere expansion. The creation of an expansion is driven, not by novelty, but from a clear need. I present you here the first iteration of all new concepts on the cards. No Explanations or Examples yet. We’ll keep the iterations lean. If you have feedback, you can find me on ‘All the channels’. In the first version we had 20 cards per dimension. We noticed that some important cards were missing. The new expansion will cover these. Heuristics: Possible ways of tackling a problem. Techniques: Clever activities we use in our testing to find possible problems. Feelings: Every feeling that was triggered by your testing should be handled as a fact. Quality Aspects: Possible aspects of your application that may be of interest. Patterns: Patterns in our testing, but also patterns that work against us, while testing such as Biases. Dimensions are the aspects of the cards that are divided by represented colors. We felt like some important dimensions were missing. Both of these are mainly operations related, a not to be underestimated part of testing. Hardening: (working title) Concepts that improve the underlying structures of your software. Compare this dimension to muscle building – You need to strain your muscles until the weak parts get small tears, the tissue can then regenerate and build a stronger, more robust muscle. We test, exercise and strain the product so that we can fill the cracks with smarter ideas, better code and stronger software. Post-Release: (working title) Tactics, approaches, techniques,… that improve the ability to see what’s going on – and orchestrating safe changes in your application’s production environment. When something goes wrong, goes well, brings in money, throws an error, becomes slow,… You can see it and its results. I’m out of my water here. There’s so much I need to investigate, learn, put into words for myself before I can make it into a valuable tool for you. I welcome any feedback. Thank you for being such an amazing part of this journey already. This is a post written by Geert van de Lisdonk about a project he worked 1,5 year on as a Test consultant. My last project was in the financial sector. The product we made was used by private banks. Our users were the Investment Managers of those banks. They are called the rock stars of the banking world. Those people didn’t have time for us. We could get little information from them via their secretaries or some meeting that was planned meticulously. And in that meeting only 1 or 2 of our people could be present, to make sure they didn’t spent too much time. Getting specs or finding out what to build and build the right thing was not an easy task. Our business analysts had their work cut out for them but did a very good job with the resources they had. Getting feedback from them was even more difficult. Especially getting it fast so we could change the product quickly. Despite all that, we were able to deliver a working product to all clients. This blogpost is a reflection on what I think I did well, what didn’t do well and what I would have changed if could have done it over. One of the best things we did, in my opinion, were the handovers. Every time something was developed, a handover was done. This handover consists out of the developer showing what has been created to me, the tester, and the product owner. This moment creates an opportunity for the PO to verify if the correct thing has been build or point out possible improvements. As a tester this is a great source of information. With both the developer and the PO present, all possible questions can be answered. Technical, functional and everything in between can be reviewed and corrected if necessary. Getting the tester involved early is always a good idea. When the Business Analysts had decided on what needed to be made, a grooming session was called to discuss how we could achieve this. Most of the times there was already some kind of solution prepared by the Product Manager that would suit the needs of several clients. This general solution would then be discussed. For me this was a moment I could express concern and point out risks. This information would also be a base for the tests I’d be executing. The team I was in is what I would describe as a distributed team. We had team-members in Belgium, UK and 2 places in Italy. Working together wasn’t always easy. In the beginning most mass communication was done using emails sent to the entire team. This didn’t prove very efficient so we switched to using Microsoft Teams. There was one main channel which we used the most. Some side channels were also set up that would be used for specific cases. People in the team were expected to have Teams open at all times. This sometimes didn’t happen and caused problems. It took some getting used to, but after a while I felt like we were doing a decent job! When I first joined the team the stand-ups happened very ad-hoc. You could get a call between 9am-3pm or none at all. Instead a meeting was booked with a link to a group Skype conversation. Everybody was now expected to join this conversation at 10am for the stand-up. This was a great improvement! Every sprint we would start with a planning meeting and set out the work we were supposed to do. But there were also ceremonies missing. At no point in time was there a sprint review or a retrospective. This meant that developers didn’t know from each other what had been finished or what the application is currently capable of. The biggest missing ritual in my opinion was the retrospective. There was no formal way of looking at how we did things and discussing on how we could improve. Having a distributed team didn’t help here. Also the high pace we were try to maintain made it difficult. But if the PM would have pushed more for this, I think the team could have benefited a lot. There was no incentive to write unit tests. So there were only a handful of them. Not because the developers didn’t want to. They even agreed that we should write them! There was just nobody waiting for them so they didn’t write them. There were multiple refactorings of code that could have been improved with unit tests. Many bugs were discovered that wouldn’t have existed if only there were some unit tests written. But since nobody asked for it, and the pace was to high, no time was spent on them. This project was ran at a fast pace. Between grooming and delivery were sometimes only 3 sprints. 1 for analysis, 1 for development, 1 for testing/fixing/deploying. This got us in trouble lots of time. When during development raised new questions or requirements emerged, there was little time for redirection. Luckily we were able to diminish the scope most of the time, but I still feel we delivered lower quality than we would have liked. Looking back, it was difficult for the PM to know exactly what I was doing. We used TFS to track our work, but it wasn’t very detailed. The stand-ups did provide some clarity, but only a partial message. My testing was documented in a OneNote on the SharePoint, so he technically could verify what I was doing. Although admittedly this would require a lot of energy from him. I think he would have preferred pass/fail test cases, but I didn’t deem that feasible with the high pace we were trying to maintain. In hindsight I could have delivered weekly reports or sprint reports of what was done and what issues were found or resolved. This would would of course take some time at the end of the sprint, that could be an issue. I did look for a decent way to report on my testing but never found a format that suited me. We were working CRM Dynamics that was altered to fit the needs of our customers. Both the system and the product were built in such a way that most setting could be altered in the UI. It took me a while to learn how these things worked but managed to resolve bug myself. Sometimes I didn’t know how to resolve them in the UI. I would then take this opportunity and have the developers explain to me how to resolve it next time I encounter something similar. Since the framework restricted us in some ways, we also made use of a C# middleware to deal with more complex things. The middleware issues were harder for me to resolve so I don’t think I would be able to fix those by myself. The middleware developers being in Italy also complicated things. Pairing on the bug fixes could have taught me a lot. This did happen from time to time, but not frequently enough so I could dive in and sort things out myself. Additionally, having more insights into the application would have been a nice luxury to have. Through tools such as ‘Dynatrace’, Application Insights,… I could have provided more information to the developers. Despite the high pace this project was ran, we still managed to do very good things. The people on the development team were very knowledgeable and taught me a lot. Sure there were some things that I would have liked to change, but that will always be the case. To me the biggest problem was that we didn’t reflect on ourselves. This meant we stagnated on several levels and only grew slowly as a team and a product. I learned that I value (self-)reflection a lot. More than I previously knew. I started looking for other ways to reflect. At DEWT I got advised to start a journal for myself. This is something I plan on doing for my next project. Currently I have a notebook that I use for all testing related events. Not yet a diary, but a start of this self-reflection habit! I also learned how I like to conduct my testing and where problems might have risen there. Focus on people and software instead of documentation. I would add some kind of reporting to show of my work. I’ve been looking in good ways to do this report, but am yet to find a format that suits me. Ever since I left my short stint at the meat factory, I’ve been a Software Testing Consultant for all of my modest career. Until a few months ago, when fate threw me into a Product Owner role. 5 months in, I feel my priorities, my thinking, my mindset… change. This is not necessarily a good thing, but it is a necessary thing. 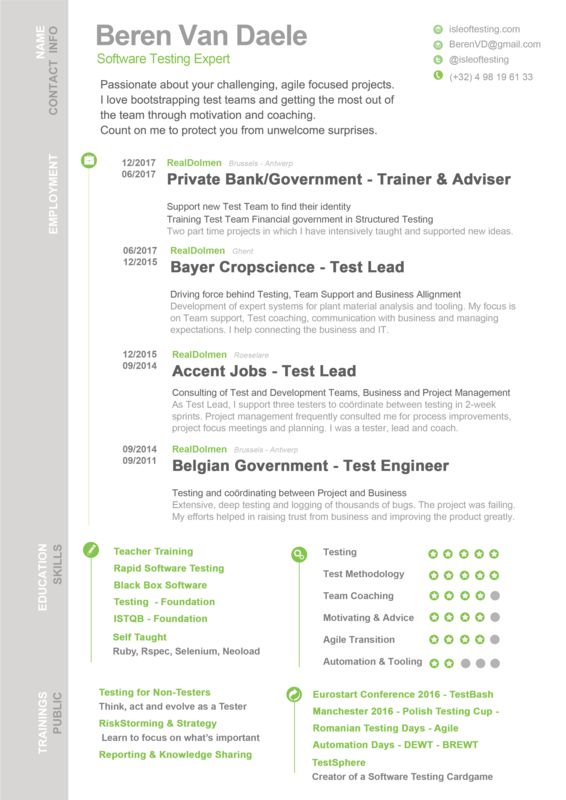 First, I was Product Owner of Test Automation. But as that team disbanded due to too much overhead for a reasonably small team, I became Product Owner of a 8-headed SCRUM team of developer-architects, a tester, a test automation specialist, a DevOps specialist and soon a new junior developer. My previous two blog posts were about helping a relatively small team learn more, move them forwards and become confident. My new role is again different and it’s providing me insights about myself, how I adapt to these dynamics. My mindset has changed drastically. Where I was focused on risks, oversights and possible problems before, I am now looking at ‘good enough’ and going forward with the things ‘that matter’. Because of my Testing background and my now PO role, I realise that those two things are very different for me than other team members. I don’t know the risks well enough, I don’t know the scope too well (as the product is very new to me) and I can only guess at the value our changes bring. Yet, this doesn’t seem to stop me forming opinions and making decisions. It frightens me to take steps forward into this vast uncertainty of unknown unknowns knowing that I’m probably on top of the Dunning-Kruger ‘Mount Stupid’. I have critisised many Product Owners before, when I was a tester, that I could see they had no clue what they were doing or where they were going. I’m beginning to believe that this uncertainty is a big part of the role. I need a tester to keep my feet on the ground. I need this done as early as possible. Because of that, I’m not thinking of 3 out of 4 types of work. When you find yourself in a situation where you don’t know enough or feel inadequate, start learning, reading and discussing. That’s what I do at least. I needed to ‘up my game’. One extremely important finding for me were the four types of work featured in ‘The Phoenix Project’: Business Projects, Internal IT, Changes and the highly destructive Unplanned Work. This connected several frustrations of mine into one model. My current customer is quite good at pinning down Business Projects. At the very beginning, we do a three-amigo kind of thing where we lay the fundamental vision for the project and immediately try to cut down all the surrounding waste. Internal IT is handled reasonably, though the responsible people seem to live on a well frequented island. We have two Admins who seem to troubleshoot and fix several major problems a day. Changes are frequently happening, but are largely unmanaged. I’ve added a blank User Story in our sprints to capture ‘surprise tasks’. This should create a good baseline to see where these change requests come from and how much time they soak up. From there on out we can create procedures to mitigate, ignore, prioritise, escalate… What exactly we’ll do with the data, I don’t know yet, but we’ll have a better idea on how to tackle these changes. I finally can put into words why I as a tester was often a source of frustration for a Product Owner: Unplanned Work. This type of work disrupts your whole flow, motivation, plans and ultimately, can destroy your project. Call it, bugs, risk, oversights,… it’s everything that suddenly requires someone’s attention and who can therefore no do anything that was planned. It eats your plans. It tears apart your flow and energy. It makes sure people get frustrated. When Work In Progress is often called the silent killer, Unplanned work is the loud bloody zombie apocalypse that comes to exterminate your project. It terrifies me. … enter the jolly testers who tell us we forgot about something important. Nor I, nor the team, was amused. A year ago, when I was a tester in this situation I would raise many bugs, make them visible and be loud about the frustrations I could notice in the team. In similar occasions, I’d have given up and watch the train ride into a wall (again) to then see what we could make of the pieces. Being in this situation as a Product Owner I try to make the best of the situation. Hope for the best and try to plan for the worst. The data in 1 will be a baseline to come up with certain Change Procedure(s). From the data in 2, we can build automated checks, monitoring, alerts and ‘have you thought about/talked to X’-checklists for management. I’m now in a role where I don’t have to be the 20-something-year-old screaming bloody murder anymore. It might sound strange or unfair, but my words have more impact these days. I won’t complain. This phenomenon has given me the power to actually strategise and bring change while being very obvious about it. I’m not trying to persuade people to follow my ideas anymore. I’m gathering them by being direct. I want to avert future disasters like we’re now in. I want the team to be on top of things. Maybe in the future, we’ll simulate our own disasters, while we’re still in control. Just for fun. And learning. In my previous post, I explained the strategy I envisioned for the team. Comparing it to a boardgame. What this post lacked thoroughly, was a clear focus on team learning. I feel like an idiot for not noticing this earlier. What has become abundantly clear to me is that the Team Members are the heart of your team. They need to be nurtured, grown. In our team, we’ve been actively investing into people to become more confident and knowledgeable. ‘Learning objectives’ have become about 50% of our sprint stories. I add in: Spikes, Proof of Concepts, Blog Posts, Challenges,… to have people work through material and produce reports, concepts, demo’s or anything that reproduces the acquired knowledge. After that, they ask feedback from other team members, discuss or teach. The aim is to achieve two things: new learnings and something valuable for the team, project or product. This keeps our stakeholders happy and our team in learning-mode. But 50% is a lot of time… how do you explain this to stakeholders? Test Automation is a valuable endeavor. Though in uncertain conditions it can be rendered useless, time consuming or time wasting even. That’s where we are now with the team. Many different things are changing. The application, the architecture and the development teams are all getting a good shake. This is not a good moment to heavily invest in UI or even API checks. Instead, I shift the focus of the team in a different direction. I see a lot of opportunities to coach, train and pioneer automation strategies, as a team. Once the dust settles from all the management decision-making and architecture workshops it’ll fall on the automation people to strongly improve our release pipeline. To achieve this, we need to become better at what we do, need to become more confident in what we say and become more respected for the value we bring. Instead of building more automation, our focus shifts to coaching, training and knowledge sharing. The issue, however, is that we first need to do knowledge gathering and train ourselves. The good thing is, we’re more of a team now than before and we can help each other out. We also have some time to invest in ourselves, which will pay off tenfold in the future. Hopefully. In congruence to the team building up their skills, I’m monitoring progress of these changes and looking for opportunities to help out. Whether it’s now or in the future, I want to know where we can add business value fast. Additionally, I’m collecting examples of good practices in our context and using those as a basis to build an automation strategy. Changes are coming our way, but we’re preparing to deal with them.